The PEN Ten is PEN America’s weekly interview series. 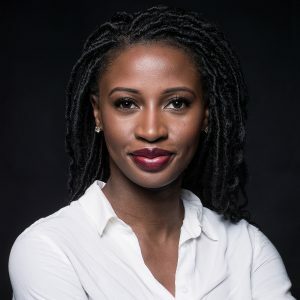 This week PEN America’s Public Program Manager, Lily Philpott, speaks to Wayétu Moore, author of She Would Be King, published this year by Graywolf Press. See Moore in conversation with Amitava Kumar, Ingrid Rojas Contreras, and Rakesh Satyal on December 12 at the Strand Book Store for PEN Out Loud: Lest We Forget, a 2018 retrospective. I intentionally disengage with my understanding of history when I write. I am fact checking myself more than ever, because I get that some aspects of my worldview are skewed based on the political/religious motivations of others. “Alternative facts” can be inherited, and I want to always challenge myself and my writing to get as close to an objective truth as possible. When I know what those truths are, I am more confident to explore how they can be distorted to serve my art in the genre of fiction. I believe my work is a natural response to the devaluation of black lives and bodies around the world. It’s a natural response to ahistorical texts that undermine the agency of Africans when exploring the formation, preservation, and/or defense of their cultures and societies. I sometimes wonder if my work would be in conversation with resistance and rebellion in the way that it is if I were raised in Liberia or elsewhere. Of course then there may be other things that were being subconsciously addressed in my work, but I do recognize that the desire to resist stems from being socialized in a system that institutionally devalues my worth. I’m not sure which I would consider the worst—the centralization of power, obstruction of democracy, or intersocial censorship. It depends on the season. In situations that I’ve felt stunted in the past, I’ve found that I censored myself from revealing a truth that I believed would be too disruptive. I am sometimes afraid and I’m still getting to the bottom of why. I’ve been working on that. Avoiding self-censorship. Attempting bravery in asserting my truths. I’m currently editing my memoir and in it, I explore the world of women rebels in Liberia’s 1990 civil war, and the kinds of things they did to redeem their humanity while simultaneously enacting unspeakable brutalities on fellow citizens. I recently rewrote a chapter that categorized one of these women as a “good woman” and that brought up various emotions. I had to take a break for a few days after that section. What does it mean to be good? Yes, but only in interviews. I’m confident in what I produce creatively, but discussing my process, my intentions, and everything that goes into that production is more difficult than anyone can prepare you for. Writing is such an intimate act. Talking about writing is the exact opposite of that, and every once in a while I wish I knew better how to navigate those conversations. Post. I don’t mind social media. I’ve chosen one where I post regularly—Instagram. I’ve found that it’s a great way to connect with readers and other writers. 9. In an interview with The New York Times, you discussed the profound absence of stories about Liberia and Africa while in school in Texas. Can you speak about your reasons for founding the nonprofit publishing house One Moore Book, and the work you’re doing to minimize that absence for future generations? I found a 2010 study by students at Saint Mary’s College in California, which compared U.S. population data with books by and about kids of color. They used data from the census and cooperative children’s book center and found that minority children were grossly underrepresented in children’s literature. Blacks made up 12.6 percent of the population that year but only 4 percent of children’s books about them. Hispanics made up 16.3 percent of the population but only 1.9 percent of books were about them. The most important support that a child can be given to ensure the successful management of their future is literacy. And it does, at least in my experience working with literacy-focused nonprofits over the years, assist with their engagement and investment in the literature they’re presented if there is some cultural relevancy. So I started my press. The goal of the company is to provide books to children who rarely see themselves in books. Our books also serve the dual purpose of giving children here a glimpse of countries they may never have an opportunity to visit. 10. Can you tell us about a piece of Liberian writing that has influenced you that readers might not know about? I’m inspired by the poetry of Patricia Jabbeh Wesley. I started reading her poetry in college after conducting a Google search for Liberian poets. A friend had asked me who my favorite Liberian women writers were, and I didn’t have an answer. One of my faves of hers, “I Go Home,” can be found here.